Often times I run into people who are not only on a gluten free diet, but an egg free diet as well. Egg allergies are among the most common, so it's good to know how to tweak a gluten free dish to serve a larger audience. For nearly 10 years, we have been using milled flaxseed as an optional egg replacer. It has worked beautifully again and again. Besides getting rid of the egg, this egg replacer adds a bit of fiber to our gluten free baking. Fiber is often lacking in gluten free baked goods, so any little tricks we can use to boost that fiber are great tools for our gluten free kitchen! When using flaxseed as an egg replacer, you want to buy any milled flaxseed, or better yet, mill your own by grinding whole seeds in your coffee grinder, blender, or food processor. What you'll see pictured is a pre purchased milled flaxseed. If you grind your own, you will have a finer end result. Also, you can purchase the golden flax for a lighter texture and color. 1 egg = 1 tablespoon milled flaxseed + 3 tablespoons hot water. This works great with gluten free/dairy free pancakes, waffles, chocolate muffins, chocolate cake, and quick breads. For some products, such as the Breads From Anna mixes, I actually prefer the end product when I use the milled flaxseed egg replacer. There are a few things that I don't love using this egg substitute for. I find that the flavor comes through a bit too strong in a pumpkin pie, a white cake, and a brownie has trouble setting with equal ratio of this egg substitute to egg. For obvious reasons, a high egg white recipe won't fare well with the flaxseed replacer, but for so many recipes, it is a great choice. Want to boost your omega 3 and fiber? Add 1 tablespoon of milled flaxseed to your hot cereal (just when you sit to eat, don't cook it for this purpose). Add it to your yogurt, your salad, or any dish that you can tolerate a little extra texture. You can add up to 3 tablespoons a day, per adult. (note, if you are eating a high fiber diet, it is essential you drink plenty of water to keep your fiber from blocking en route). A xanthum gum substitute. 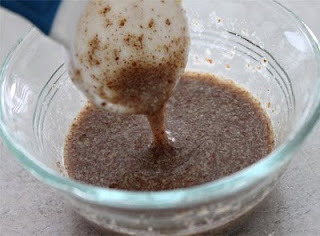 We went through a spell where we could not do corn, so I just tried subbing milled flaxseed for xanthum gum...why not? Well, I found out that for almost EVERY recipe, this works beautifully. I know there are many gluten free bakers who will swear you MUST use xanthum gum, but we have not used it in 5+ years, and our baking results speak for themselves. I enjoy the affordability of this little seed, as well as the many health benefits. Chia seeds can be used in a very similar manner. I will soon be posting a great coconut and chia seed pudding recipe for you to enjoy! Store your flaxseed in the refridgerator or freezer. What was the sweetener used (and quantity?). And what pan size were you using? I have found, by and large, that cooking shallow works best when doing egg free, dairy free, gluten free baking. So, I would not likely make one thick round cake, instead I would use two round pans, make two very thin cakes and stack them, or make cupcakes. I have a great pan that works wonderfully for gluten free baking because it is 13x13 inch square, which lets the gluten free batter spread out and cook more evenly. Still, I have not mastered a truly wonderful WHITE cake that is egg, dairy, and gluten free. I can do tasty vanilla yellow cakes, sponge cakes, and so on, but capturing that fluffy white cake without using a plethora of egg whites and white sugar is a challenge! The rice flour is most likely to blame for grainy texture. Many GF bakers dislike using rice because for so many, the texture is too gritty. It doesn't bother us at all, but others comment on it from time to time, so I know it's there! Using a variety of flours helps cut back on the grainy factor. So, for example, instead of just using rice and tapioca, you play with the portions of flour and use some sorghum or almond flour and millet flour, or bean flour (depending on the recipe). At home, I often use 1 cup rice (often brown rice, because it's healthier - although grainier), 1/4 cup tapioca starch, 1/4 cup millet, 1/4 almond. I mix those and use it as an "all purpose" for many things (maybe not bread, but works great for muffins, cookies, pancakes, waffles). And I change it up depending on what flours I have on hand.